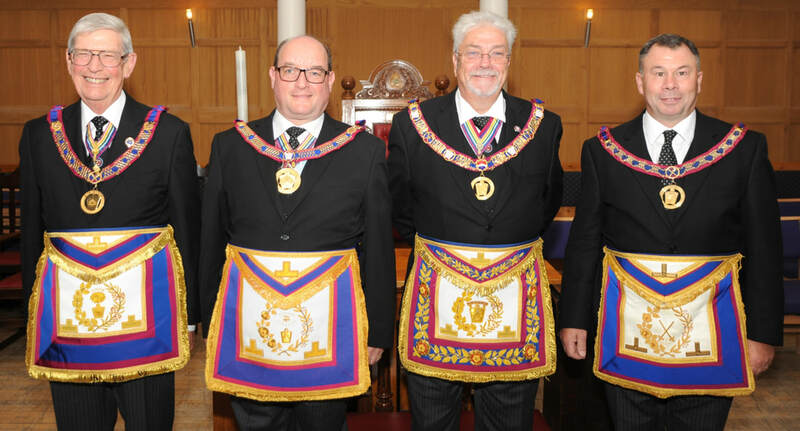 Essex Mark Masons assemble annually as a Provincial Grand Lodge in the picturesque settings of Felsted School; all Mark Master Masons are entitled and encouraged to attend. You do not have to hold a provincial rank to attend, all Mark Master Masons are welcome and cordially invited. Remember, it is your Province; your Provincial Grand Master and your friends and brethren who will be honoured with appointments that day. By attending you will increase their enjoyment of the event and be a part of the day yourself, you will have the opportunity to meet old and new friends and mix in the relaxed atmosphere that is so characteristic of "the friendly degree"
Here the Provincial Grand Master and his executive hold the normal "business meeting" for the province; the annual accounts are presented, debated and adopted as are all the other reports. Importantly, of course, Provincial Appointments are made with Brethren receiving first appointments and promotions, each conferred on the recipient personally by the Provincial Grand Master. The PGM also addresses the brethren and updates and informs the Province accordingly; his speech is a comprehensive report of where we are and where he hopes we will go. Afterwards there is a splendid festive board that never fails to please; there are formal toasts and addresses and, usually, a lively mix of humour. If you have never been then don't miss another one, details of the next meeting will be published well in advance on this site. Speak to your Lodge Secretary who will have further details and come and enjoy the day. Details of the previous meeting, minutes, appointments will be in the news section. Felsted School, the venue for Provincial Grand Lodge. Click on the photo for their website.